Whatever the process industry, flaw detection remains a top priority in terms of maintenance and safety. The latest flaw detection equipment, says Sean Ottewell, is designed to be flexible, lightweight, and easy to use. When it comes to flaw detection in the process industries, instrument flexibility is high on the list of today's requirements. With this in mind, GE Sensing & Inspection Technologies has launched a new family of ultrasonic flaw detectors which specificially provide inspectors with a flexible platform in the face of changing inspection needs. 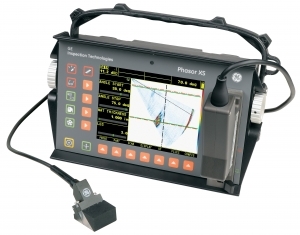 The Phasor family incorporates conventional and phased array ultrasound technology in three upgradeable models: Phasor CV, Phasor 16/16 Weld and Phasor XS. The tiered platform offers inspectors the opportunity to select the model that best suits their specific application, whatever the process being investigated (Fig.1). "The development of the Phasor platform demonstrates GE's total commitment to developing solutions that will grow with our customers," says Patrik Rooman, general manager ultrasound. "The Phasor platform allows users to chose a technology that meets their current needs and provides them with an easy and cost effective upgrade path for the future." The PhasorXS, the first product in the new family, is a portable ultrasonic phased array flaw detector that provides the highest resolution and probability of inspection. It also offers timed or encoded TOPView software for corrosion mapping. The Phasor16/16 Weld is the mid-level solution, which offers phased array and conventional capability within a portable ultrasonic flaw detector. It produces full colour image scans that can be stored as a jpg for remote analysis and archiving. The detector comes with a weld probe and package, making it ideal for detecting cracking, lack of fusion, inclusions or porosity in welds, both during fabrication and in service. Lastly, the Phasor CV rounds out the portfolio and is a conventional single channel ultrasonic flaw detector. Users are able to start with the top-of-the line the Phasor XS and have access to all capabilities or begin with the Phasor CV and expand the solution as inspection needs change. According to GE, each solution within the Phasor platform is compliant with all major inspection codes and is suitable for a wide range of tasks from simple echo amplitude comparison to complex DGS evaluation. The Phasor is used for applications ranging from corrosion monitoring to defect detection and sizing. "The easy-to-use interfaces, durability and accuracy of equipment make it easy for inspectors to operate and increase productivity. 'The Phasor platform is a cost effective way for organisations to achieve the benefits of phased array ultrasonic inspection and provides the ability to choose what solution best fits current inspection needs," says the company. For its part, Olympus is focusing on size and portability with its latest flaw detection technology. Its EPOCH LTC Digital Ultrasonic Flaw Detector offers state-of-the-art technology in a package that is both compact and lightweight - 0.96kg. Based on the design of the well-known EPOCHXT, the EPOCH LTC is a full-featured instrument with EN12668-1 compliance and a wide variety of standard features as well as specialised options to meet individual inspection needs. "Ultrasonic flaw detection is widely used for locating and sizing hidden cracks, voids, disbonds, and similar discontinuities in welds, forgings, billets, axles, shafts, tanks and pressure vessels, turbines, and structural components," notes the company. The instrument features a bright, multi-colour transflective display with full VGA (640 x 480) resolution providing a high resolution A-scan and superior visibility in all lighting conditions, including direct sunlight. The EPOCH LTC is also designed to the requirements of IP67, assuring that the instrument will perform in the harsh environments common in the inspection field. In addition, a simple keypad design that allows full control from left or right hand for direct access to important functions. Rapid parameter adjustments, and recall of instrument set-up (CAL) files are quick and easy. Available in English, international symbols, Japanese and Chinese, four customisable function keys allow the operator to select preset values for instrument set-up parameters. Finally, advanced software features and data management tools can calculate signal amplitude as a percentage or dB level compared to a DAC curve or a reference echo amplitude fixed with time varied gain (TVG).